Our great Chapter has several ways to become more involved, one way is through committees. Leverage your talents and gain experience by volunteering your expertise on one or more of our committees. Please contact the committee chair if you are interested in learning more! Participate in helping the GSFV Chapter reach our Ten Star Goal each year by fundraising on behalf of AFP's Be the Cause campaign. Members of this committee create campaigns to encourage members and guests to donate toward our annual chapter goal. Contact Margarete Preusser to join this committee! Did you know that our chapter luncheons earn you credit toward your CFRE? Did you know that our chapter leads a monthly study group that helps members obtain their CFRE credentials and open doors to greater opportunities in their fundraising careers? Committee members facilitate meetings and help ensure that all Chapter luncheons are registered with CFRE International so that members and guests can have this benefit. Contact Adam Pilder to learn more about the CFRE Study Group and/or join this committee! Volunteers are welcome to join the communications committee, which manages content for our monthly newsletter and social media profiles. This committee is also responsible for reviewing and updating the chapter website and volunteering when needed to help with registration and check in at chapter events with bigger turnouts. This is an excellent opportunity for members who want to hone their communication skills as part of their career development! Contact Randi Lovett to join this committee! AFP has always prioritized the incorporation of fundraising ethics and member diversity as part of their overall culture of fundraising. The IDEA committee commits to sourcing and scheduling educational components around these ideas for the benefit of our membership. Contact Nancy Ackerman to get involved with this committee! Following the success of our inaugural Conference in 2018, the chapter is committed to growing this opportunity in bigger and better ways in 2019. Join the team responsible for producing the educational conference in May by assisting with sourcing sponsorships, designing sessions, finding speakers, advertising to attendees, and finding volunteers. Perfect for any volunteer who wants to incorporate (or improve) their event planning skills! Contact Suren Seropian to join this committee and make a huge difference! We love our chapter members and are always looking for volunteers to help new members feel welcome and returning members to feel appreciated! 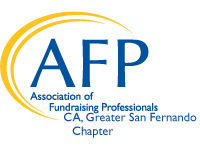 Joining the membership committee is a great way to network directly with other fundraising professionals in the Greater San Fernando Valley, and provide valuable feedback to the chapter's Board of Directors on what members (and not-yet-members) want most from their participation. Contact Shani Grafman to join the Membership Committee. Once a year, our chapter joins countless others as part of AFP's National Philanthropy Day to celebrate those whose support of charitable organizations improve our communities. This committee works hard to put together an incredible luncheon - from distributing requests for nominations, assembling a Blue Ribbon committee to select honorees, and solicit support from the community by way of sponsorships, program book ads, and selling tables and tickets. Contact Suren Seropian to get involved with this committee. Want to help develop the vision and set goals for our Chapter? Now seeking strategic thinkers to lead the Strategic Planning Committee. This is an excellent opportunity for those looking to take the next step in their careers in leadership roles. Contact Jenny Daniels Freese to volunteer in the Strategic Planning Committee. Our chapter endeavors to meet the needs of our diverse membership by providing a broad range of topics and speakers at our monthly luncheons. Join this committee to help guide the coming year's topics and help secure speakers for our members to enjoy. Contact Suren Seropian to join this newly-formed committee.